If you are in the Minneapolis/St. Paul area and are looking for a quality siding contractor, look no further than Walker Roofing. We have been siding homes in the Minneapolis area since 1938, so you know you can count us to get the job done right, and get it done right the first time. 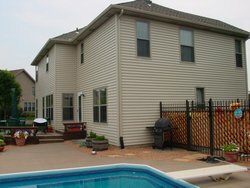 Our expert siding installers can come to your Minneapolis/St. Paul home, provide you with a free, no obligation estimate, and start the siding process. Our turnaround time is some of the best in the Twin Cities area. Walker Roofing offers professional-strength aluminum siding for residential installation. Our sturdy, quality siding products are built to withstand the strongest of storms and harsh weather conditions. Call now to inquire about color palettes or free estimates.